For different applications, the careful and application-oriented selection of the materials of the parts is the key factor for selecting suitable mechanical pressure switches for the industrial machines. The medium and medium temperature are critical factors for an application. This blog post encourages users to evaluate their applications before selecting a suitable and functional mechanical pressure switch. 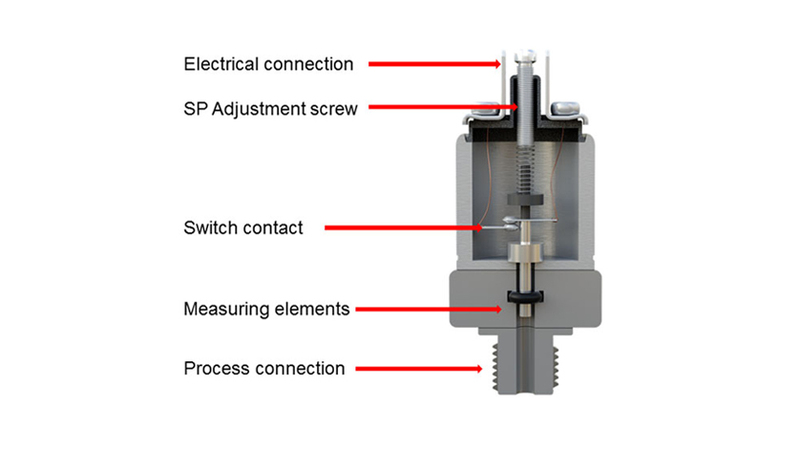 A mechanical pressure switch is designed with process connection, measuring element, switch contacts, electrical connection and set point adjustment screw. The commonly used material for the case and wetted parts (process connection) is galvanised steel or brass. For humid working environments, stainless steel (for example ANSI 303) is the best choice. If the plant manufacturer wants to reduce the cost, steel with zinc nickel coating can be a good solution. One of the core parts of a mechanical pressure switch is the measuring element. For these elements elastic diaphragms or stainless steel pistons are commonly used. The diaphragm is designed for vacuum or low pressure ranges up to 16 bar, whereas the piston is suitable for higher pressure ranges up to 350 bar. For different media and medium temperatures, a wide range of materials to meet the different requirements is available. For example, nitrile butadiene rubber (NBR) is suited for air, hydraulic oil and medium temperatures from -20 °C to +80 °C. If the medium is water, ethylene propylene diene monomer rubber (EPDM) is a better solution. For medium temperatures up to 100 °C, fluorosilicone rubber (FVMQ) is a solution to fulfil the high-temperature requirements. Further information on mechanical pressure switches can be found on the WIKA website. Jing Lyu MBA, Dipl. Ing. Since October 2015, I have been responsible for the pressure switch programme for industrial applications as a WIKA product manager. I am interested in new products as well as new technologies. With my articles, I would like to answer emerging issues on pressure switches simply and understandably.